When Ada’s clubfoot is surgically fixed at last, she knows for certain that she’s not what her mother said she was—damaged, deranged, crippled mentally as well as physically. She’s not a daughter anymore, either. Who is she now? World War II rages on, and Ada and her brother, Jamie, move with their guardian, Susan, into a cottage with the iron-faced Lady Thorton and her daughter, Maggie. Life in the crowded home is tense. Then Ruth moves in. Ruth, a Jewish girl, from Germany. A German? Could Ruth be a spy? As the fallout from war intensifies, calamity creeps closer, and life during wartime grows even more complicated. Who will Ada decide to be? How can she keep fighting? And who will she struggle to save? 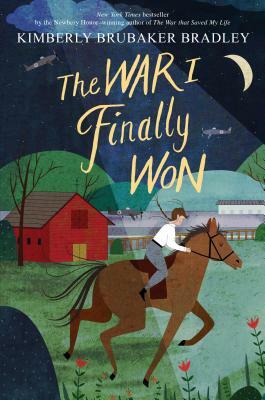 Ada’s first story, The War that Saved My Life, was a #1 New York Times bestseller and won a Newbery Honor, the Schneider Family Book Award, and the Josette Frank Award, in addition to appearing on multiple best-of-the-year lists. This second masterwork of historical fiction continues Ada's journey of family, faith, and identity, showing us that real freedom is not just the ability to choose, but the courage to make the right choice. Kimberly Brubaker Bradley lives on a forty-two-acre farm in Bristol, Tennessee. She is the author of several books for children, including Leap of Faith, Jefferson’s Sons, and the Newbery Honor book The War that Saved My Life.